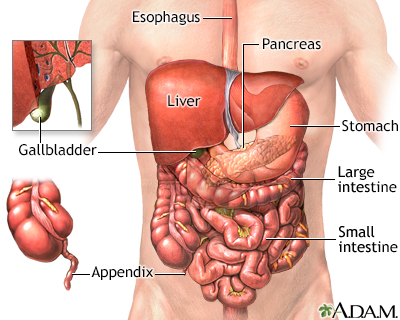 The process of digesting food is accomplished by many organs in the body. Food is pushed by the esophagus into the stomach. The stomach mixes the food and begins the breakdown of proteins. The stomach propels the food then into the small intestine. The small intestine further digests food and begins the absorption of nutrients. Secretions from the pancreas in the small intestine help neutralize the acid in the intestine to provide a proper environment for the enzymes to function. Bile from the gallbladder and liver emulsify fat and enhance the absorption of fatty acids. The large intestine temporarily stores and concentrates the remainder until it is passed out as waste from the body.